If a bottle is not positioned exactly underneath the tap of a filling line, the bottle and the filling pipe will not match and liquid will be lost. Changing container formats make the task even more complicated. Absolute encoders with CANopen ensure the required accuracy. WHILE MANY FILLING LINE OPERATORS achieve good capacity utilization rates due to short changeover times and targeted conveyor regulation, only little attention has been given to an often decisive factor: a more flexible and quicker programming and positioning of the products processed. This challenges the areas of drives and sensors. These components contribute to improving the utilization of the machine capacity, as they allow processing containers with various formats in the same plant. To make this work, the entering pallets must be checked to determine the size of the bottles, their color, detect possible foreign matter or containers placed upside down. This information is supplied to the control and its positioning. Encoders are used at many different points of the plant to take accurate positioning. For example, they ensure the accurate operation of palletizers and depalletizers. At the filling point, they allow synchronous operation and position synchronicity. When the crown corks or screw caps are placed on the bottles, the conveyor and the capping spindle must operate in the same cycle, in order to position the cap exactly above the bottle. 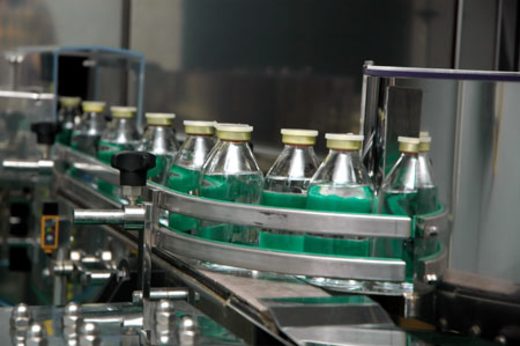 Filling lines frequently use rotary tables with aseptic (germ-free) drives including integrated encoders. They are suitable for wet areas and also resist aggressive chemicals, which are often used to clean filling lines. Encoders of the Sendix F58 series from the sensor manufacturer Kuebler are mounted inside the rotary tables for example. They are available with various serial bus system interfaces such as CANopen. It is compliant to the CiA 301 (version 4.2) specification and the CiA 406 profile for encoders. In addition, the manufacturer offers a variant with a through hollow shaft (model F5888). option for the CANopen variants. Besides the capacity utilization of the plant, the purchasing and maintenance costs also offer possibilities to reduce expenses. 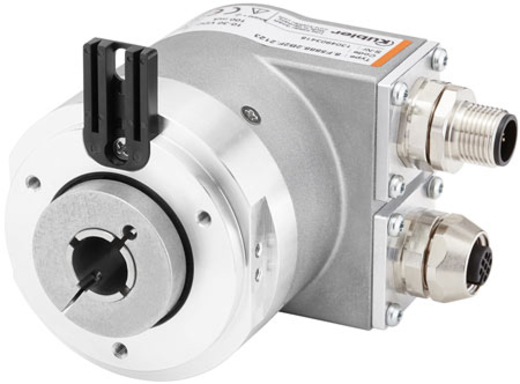 Kuebler developed improvement potentials with so-called Intelligent-Scan Technology: The singleturn and multiturn functions of the encoder are realized on an Opto-Asic. This ensures the device’s resolution, depending on the selected interface, reaching 41 bits (SSI), and the magnetic insensitivity of a purely optical encoder. A reduced number of components further increases its robustness. In addition, this also means lower manufacturing costs than for a multiturn encoder with mechanical gear. Consequence: lower maintenance costs. In the standard size of 58 mm, this encoder features a through hollow shaft with a diameter up to 15 mm. This allows implementing further equipment and motor options on the shaft. The proportions leave space for extended functions and are based on the Safety-Lock Design of the manufacturer: the materials used, up to the fastening and mounting technology, resist high loads and ensure a stable bearing structure. This bearing includes mechanically interlocked bearings and wide bearing spans. This series therefore suits high shaft loads, which can appear due to thermal expansion or vibrations. With the Intelligent Scan Technology, the battery is no longer a restriction for the service life of the encoders. Their total electricity consumption is about one thousandth of the consumption of comparable encoders. This is due to the Opto- Asic, which requires little electricity and to the non-continuous scanning when switched off. When the machine is switched off and the battery supplies the encoder, the latter switches to the so-called low-power mode. It then scans the coded disk at intervals instead of scanning it continuously. As soon as the Asic detects a rotation of the encoder, it increases the scanning rate according to the speed.